Hello there, Sin City Scraps fans. It seems there is always something to celebrate, so my first thought was, of course, St. Patrick's Day. 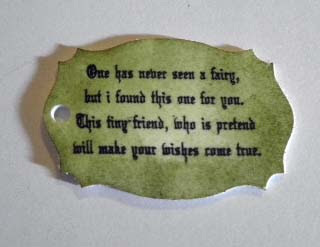 I love my new stamp plate from Sin City Scraps, Fairies Plate 2. There are so many images on these plates, and I still have not used them all. 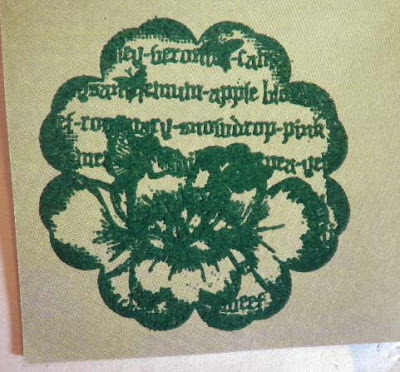 Some of the flowery like images called out to me... SHAMROCKS. 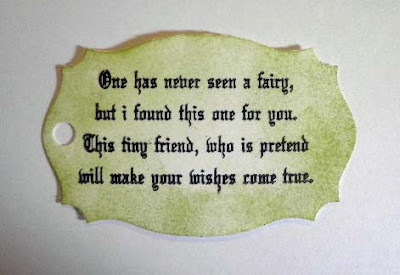 And then, there are the fairies. 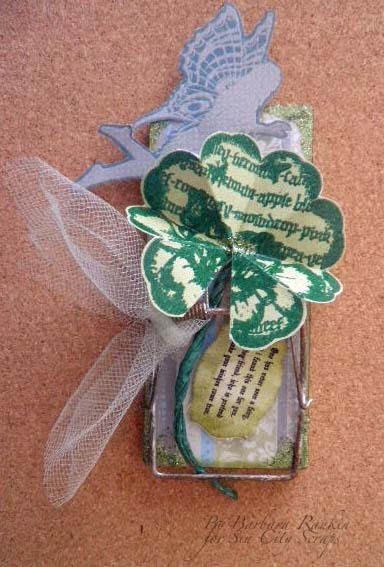 Well, what better way to celebrate St. Patrick's Day than to find a fairy and catch a few shamrocks for good luck. Just how do you catch a shamrock? With a mouse trap, of course. I am too much of an animal lover to use them for anything else than catching shamrocks or altered art. So don’t say ye haven’t been warned ! So, now that the history lesson is over, let's begin. 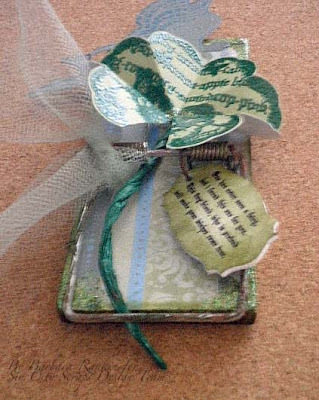 Here is my version of a shamrock catcher. First, I found these 4-packs of mouse traps at my local Dollar Tree store (with art in mind, of course). Choose a piece of plain green paper from the pad, stamp image with Versamark ink, heat emboss with Emerald Green embossing powder. Here is a little tip I learned years ago ... coffee filters make wonderful embossing powder catchers. They don't seem to have any static in them and form a funnel shape easily for returning the powder to the jar. Use them over and over again. 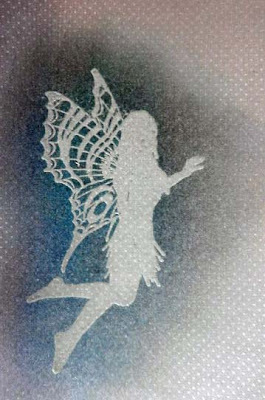 Fussy cut the stamped image, leaving a tiny edge of the paper so you do not cut into the embossing powder, which will cause it to chip off. 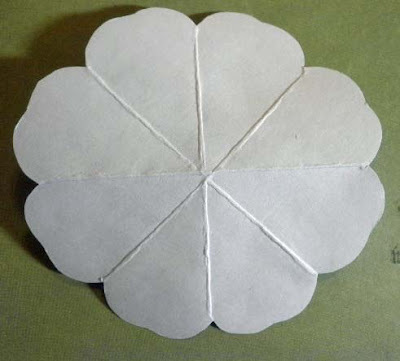 Fold each petal in half, as shown. Cut along one fold line up to the center. 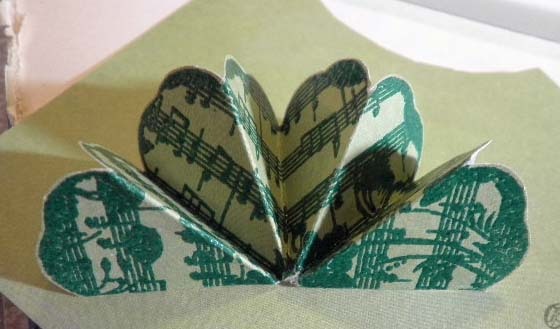 Accordion fold each petal, as shown. Are you seeing a shamrock yet? 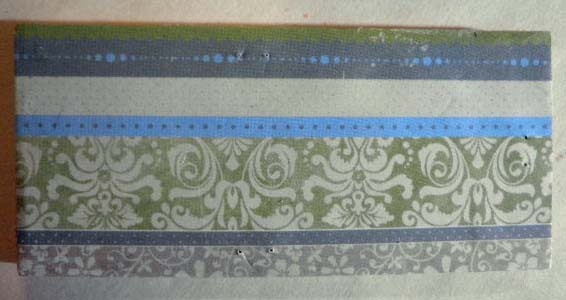 Trim a small piece of the white cording and spritz with the emerald green smooch spritz. Adhere to the back of the shamrock to make the shamrock stem. Stamp the fairy image with white pigment ink onto another piece of print paper, heat emboss with clear embossing powder. 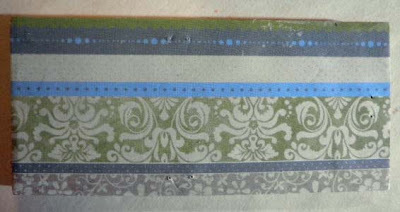 Add Distress ink colors in shaded lilac and peacock feathers. Fussy cut the fairy. 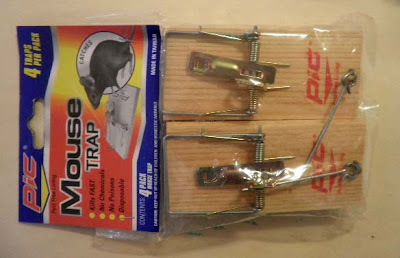 Glue her to the top of the trap, as shown. I love the fairy saying on this plate, but it is too large for this piece. So, what to do? 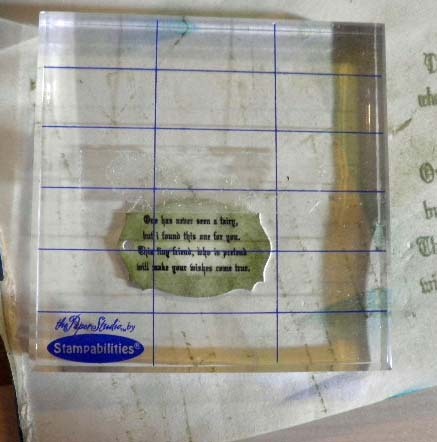 To make it smaller, I stamped it onto a piece of shrink plastic using black archival ink and added a light coat of peeled paint distress ink. The color will intensify as the plastic shrinks. 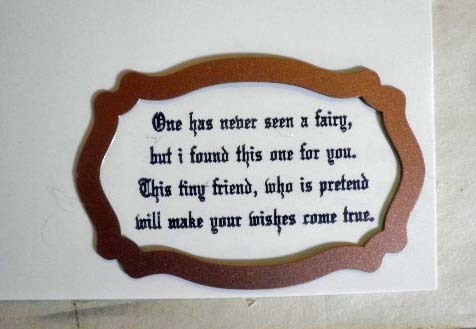 I used a spellbinders die to cut out the phrase and punched a hole in the side for hanging. 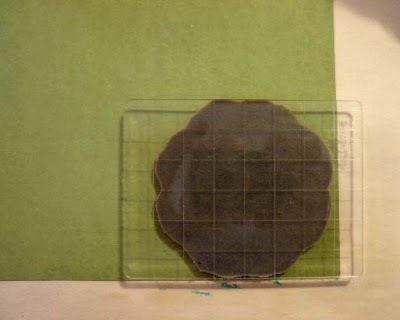 Make sure to punch your hole a bit larger than what you need, as it will shrink to a much smaller size. Use your heat gun to shrink the plastic. It will curl and look awful, but it always straightens itself out. When completely shrunk, you can flatten it with the back of your wooden stamp or acrylic block. 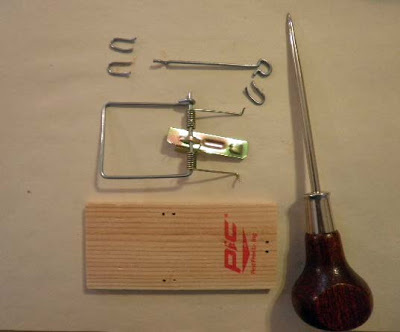 Carefully remove the metal trap parts from the wood base and set aside. I used a heavy duty awl to lift the staples up and out. A screw driver may also work for this. Cover the front of the mouse trap with another piece of print paper from the pad. I used a good white glue to adhere the paper to the wood. 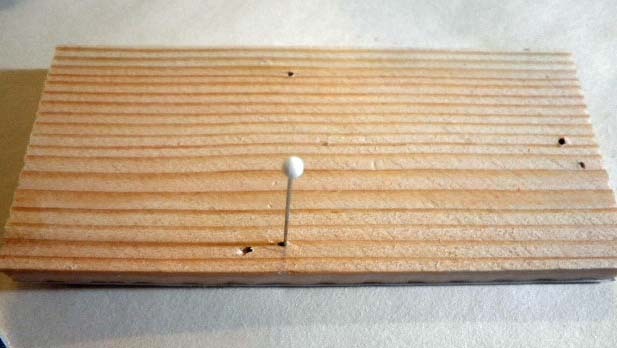 Turn the trap over and use a small pin to mark your holes on the front again. This will help you re-attach the metal parts. 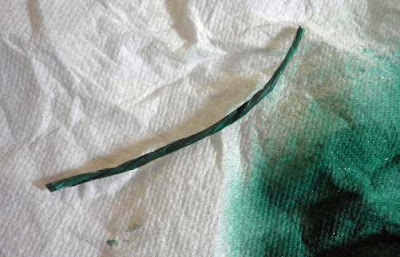 I distress inked the edges of the trap with peeled paint, and added a coat of some glittery green nail polish to the edges. I thought this finished off the sides very nicely. Re-attach the metal parts to the trap base. 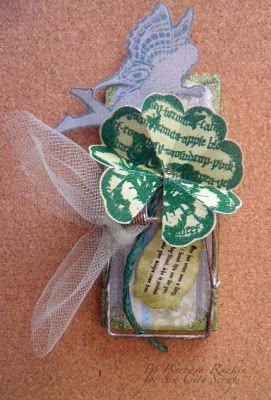 Place the shamrock beneath the clip to "catch" it. 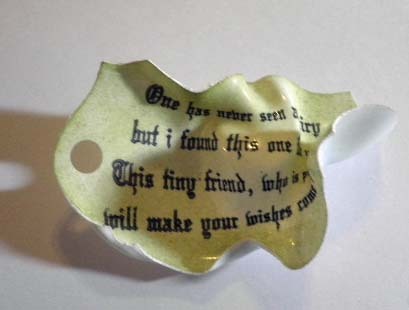 I used a jump ring to hang my saying from the top of the clip, as shown. 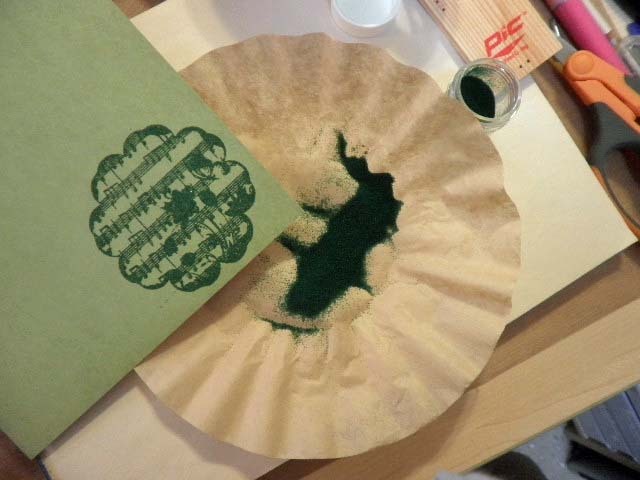 At the last minute, I decided the metal was too shiny, so I added some gilder's paste in copper and verdigris. I sure hope you like my project today. I had so much fun making this. 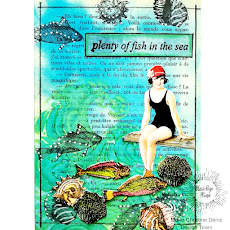 So be sure to check out the Sin City Scraps online store for more of their fabulous stamp designs and stamping products. 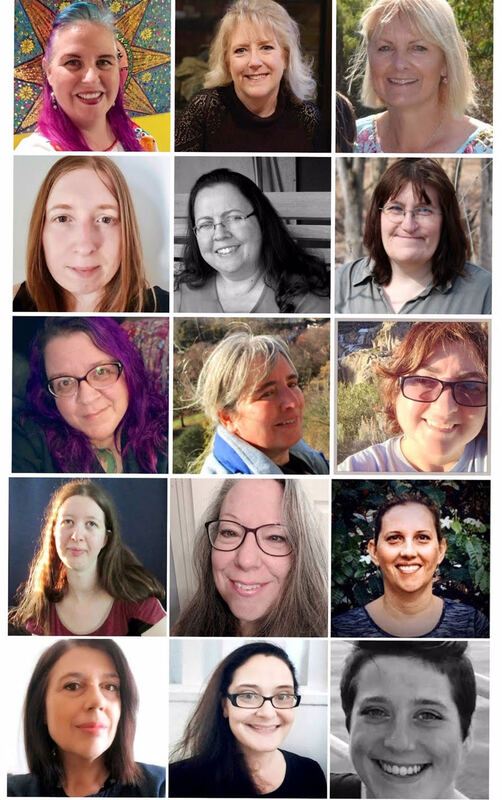 And be sure to come back to the blog often for more inspiration from the talented design team. Have a wonderful weekend, and Happy St. Patrick's Day!